Some disability activists are advocating for an updated access symbol. The Accessible Icon project, designed the new icon to display an active, engaged image with focus on the person with disability. 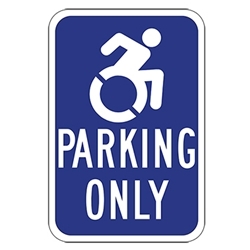 Many states use a Wheelchair Symbol Parking Only Sign. This is a different version of that sign. Featuring the "Active Wheelchair Symbol". DOUBLE the working life of your Active Wheelchair Symbol Parking Only Signs by adding 3M Protective Overlay Film (POF)! 3M’s high-tech POF protects sign faces against fading caused by the sun and harsh weather—and makes graffiti and sticker defacement damage easy to clear away without harsh abrasives.